currently under construction at Eglinton Avenue West, Mississauga. The development is scheduled for completion in 2019. Sales for available units range in price from $621,800 to over $712,800. Arc Condominiums has a total of 300 units. Sizes range from 1078 to 1237 square feet. 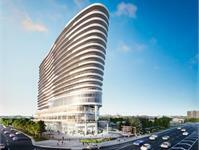 Arc Condominiums will stand as a beacon within the highly successful Daniels Erin Mills community. 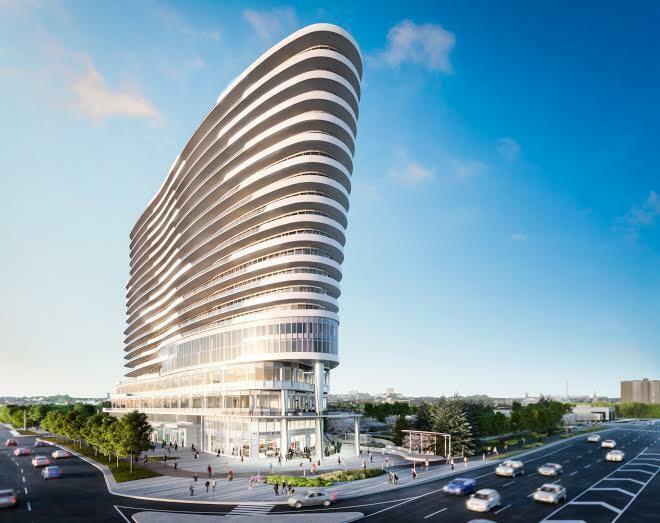 Designed to revitalize this popular intersection and ensure that people truly love where they live, this visionary, master-planned, mixed-use community will include residential, retail, office and unique outdoor amenities featuring a Courtyard & Plaza. - Approximately 9 ft. ceiling heights in main rooms*. Where bulkheads or drop ceilings are required in kitchens, bedrooms, bathrooms, laundry room and closets, the height of the ceiling will be less than 9 ft.
- Solid core entry door with stained finish and brushed chrome lever hardware. - Contemporary 3 7/8” baseboards in all areas except bathrooms and laundry room, which have a tile baseboard. - Contemporary 2 1/4” casings throughout. - Flat interior doors with brushed chrome lever hardware. - Framed sliding closet doors in foyer and framed mirrored sliding closet doors in bedroom(s), as per plan. - Designer white Decora-style switches and receptacles throughout. - Interior walls primed and painted in latex flat finish off-white paint; bathrooms and laundry/storage to be painted in latex semi-gloss off-white paint. All paint is low VOC. Latex semi-gloss off-white paint on all trims. - White textured ceilings in all areas, except kitchen, bathrooms and laundry/storage area which have smooth painted ceilings. - Poured concrete finish to all balconies; terraces to receive concrete pavers. - Laminate flooring in the hallway, living/dining room, kitchen, bedroom(s), bedroom closets, den, foyer and foyer closet, as per plan. - Ceramic floor tile in the bathroom, laundry and storage areas. - Custom designed contemporary kitchen cabinetry with soft-close hardware. - Quartz countertop with single bowl stainless steel undermount sink. - Imported porcelain tile backsplash. - Stainless steel appliances including a refrigerator with bottom-mount freezer, slide-in range, hood fan, 24” dishwasher with integrated controls and microwave. - Custom designed vanity with pull-out drawer and soft-close hardware. - One piece sink with integrated basin. - Single-lever water efficient chrome faucet. - Soaker tub with ceramic wall tile surround up to ceiling, as per plan. - Framed, clear tempered glass shower stall, with pre-formed acrylic base and full-height ceramic tile surround, as per plan. - Framed vanity mirror and light sconce. - Open linen shelves, as per plan. - Chrome bathroom accessories-towel bar and toilet paper holder included. - Compact stackable washer/dryer combination in white, vented to exterior. - Voice data, and coaxial cable wiring throughout. - Cable receptacle allowing television connections located in living room, bedrooms and dens, as per plan. - Pre-wired telephone outlets in living room, bedrooms, and dens, as per plan. - Decorative style ceiling light fixtures provided in foyer, kitchen, and bedroom(s), as per plan. - Capped ceiling light fixture outlet provided in living/dining room. - Switched wall outlet in living room and den, as per plan. - Decorative style wall mounted light fixture in the bathrooms. - All appliances connected and ready to use. - Enter-phone and camera at ground floor visitor entrance allowing in-suite viewing, available through cable television connection direct to suite. - Key Fob access throughout all common areas and parking garage entry. - Convenient underground parking with cameras in the garage at pre-selected locations, along with two-way voice communication to monitoring station. Your inquiry will be delivered to the Arc Condominiums sales team, who will send you more information about this development.